Hungary is always one of the highlights of the season. The thousands of passionate fans that attend the event creates a unique atmosphere, and coupled with an exciting track, the weekend is always memorable. The team arrived at the Hungaroring following a difficult weekend in Slovakia. That weekend three engines had to be fitted, and the final race was still very much a testing exercise. This weekend Tom needed to be racing competitively. For FP1 the team worked on the setup of the car. A good balance was found and this was taken into FP2. Here he posted ever quicker lap times, finishing up P11 with a time of 1:56:052. This was promising for qualification. Tom went out in Qualification 1 looking for a repeat performance. In what was to prove to be a very close session he improved on his FP2 time. On his 5th lap he posted a 1:55:421. This placed him 20th at the end of the session, 00:00:691 off a spot in Q2. Luck however was still not with Tom and the team. While posting this time a part holding the flat floor of the car broke in the centre, and as a result, the floor bowed down. In scrutineering on the way back in from Q1, the fault was spotted and the car failed the ride height regulation. The punishment for this would be to start at the back of the grid for the second week. Sunday and the crowds were in early chanting for Norbi. His every move was cheered to the rafters, and even down at the wrong end of the grid the noise was palpable. Tom was looking to make up places quickly from the rolling start, and as the cars past the start line he quickly made up three places. Ahead, an incident on turn 2 and Tom took advantage moving up the inside. 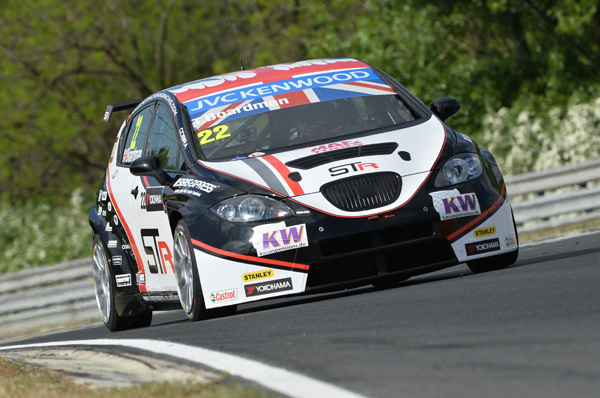 As he prepared for turn 3, Hugo Valente in his debut WTCC race, moved across and hit Tom. This broke the front right wheel, and debris also went into the radiator. On lap 3 he was forced to retire and again in the most unluckiest of circumstances. Ever philosophical about the situation Tom was determined to have a better second race. The car was pulled from Parc Ferme so that it could be fixed in time. This again would mean starting at the back of the grid. If he could get one of his trademark standing starts off though he knew he could quickly make up places. This he achieved, and he was quickly past Valente, Munnich and Kozlevsky. Ahead though, Muller and Tarquini had a coming together resulting in the Honda driver hitting the barriers. Tom just managed to avoid the tail end of the incident but lost ground and places doing so. The safety car was deployed and Tom was in 20th. On lap 4 the safety car went in and Tom set about making up places. On Lap 6 he managed to pass Valante and Kozlovsky again, then on lap 8 he managed to pass the SEAT of Marc Basseng. He then went to chase the next SEAT, that of Monje. He caught and passed him on lap 9, and with Freddie Barth having a drive though penalty he was now in 16th and chasing Pepe Oriola. On Lap 12 he passed the him and was now surprisingly the second placed SEAT. Rob Huff in the All-Inkl.com SEAT went on to take the win, the first this season for the reigning world champion. Tom finished 15th, 8th independent, and from the back of the grid again, this was a decent result.